The haste to adapt IoT technology has left many enterprises facing a growing problem: IoT security. How network and systems architects respond could determine the long-term viability of IoT technology. An interesting paradigm within the Internet of Things has emerged. Stay with us here: IoT technology is designed to improve efficiency and make everything “smarter.” IoT technology is especially vulnerable to security breaches. These security breaches are costly operationally and financially – to the tune of $2.5 million per attack for large enterprises. Security is not the focal point for IoT engineers and developers. One of those statements doesn’t add up. Like other new technologies before it, IoT is going through its honeymoon phase. Can we cut out a manual process? Can we improve data transmission speeds? Can we make our machines smarter? When the answer is yes, the solution is IoT technology. But the haste to adapt to these new possibilities has left many feeling a growing and very real problem: security. How network and systems architects respond to this problem could determine the long-term viability of technology that holds either the promise or the challenge of fundamentally changing the way our industrial sectors function. For decades, Supervisory Control and Data Acquisition (SCADA) systems have played a significant role in industrial operations. Industries like oil and gas, electric power/smart grid, agriculture, and utilities have implemented SCADA systems and networks to collect data and automate processes, and are always looking to automation systems for more effective ways to operate. The capability to collect more data from geographically dispersed field assets in remote locations has driven the need for enhanced communication technologies. The number of sensors and data points collected will continue to rise dramatically with improved connectivity. This collected data helps operators improve operational decisions, save manpower and, in many instances, keep employees safe by avoiding dangerous environments. Today, industrial network operators are increasingly implementing end-to-end IP connectivity or the Internet of Things (IoT), enabling more capabilities at the edge of these networks. This does not make SCADA systems obsolete by any means; it opens the door to greater possibilities of enabling new applications and analytics with every single data point being captured in the system. There are many implications for the concept of a connected enterprise in terms of network security. Critical infrastructure projects are only as reliable and secure as the technology serving them. Security, therefore, will ultimately be the limiting factor on how much IoT technology is deployed. 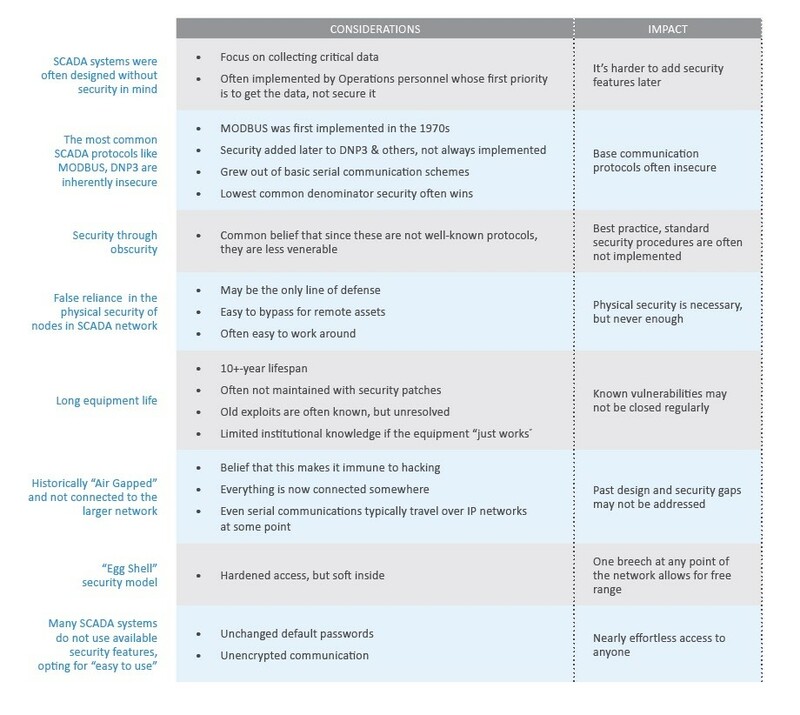 With security, the traditional trade-off is either “easy to use” or “secure”— but not both. We often consider features to be part of the equation, though in most cases operators are not willing to trade off features. Traditional SCADA systems have several challenges when it comes to security. With more data being transported than ever before, it’s important not only to secure assets, but to secure the communication link itself. Traditionally, SCADA systems have been on the outside of a firewall from the corporate IT network. Newer SCADA systems that use Ethernet devices are more security focused with measures such as VPN, secure sockets, encryption, and dedicated log-ins on the devices. With the growing use of IoT technologies, operators must realize that the system is not only providing a communications path, but also enables intelligent sensors that provide additional value when using that path. Rather than just Remote Terminal Units (RTUs) and Programmable Logic Controllers (PLCs) at the edge of the networks providing data, the sensors themselves may be running an application on the edge of the network, and many of these devices are using IP. IIoT sensors bring more capabilities and increased connectivity to these devices, and their full value may not be realized if the only connection to the device is through a PLC or RTU. Long-promised benefits, such as assessing predictive failure, become possible when the device can be accessed directly. IoT implies that data flow is no longer strictly controlled and only accessible via the SCADA system, but that data in any form from any device can be accessed by any system which needs it. There is no longer a reliance on SCADA system providers to support device compatibility if the data can be accessed through another means. With IoT, many industries are now looking at how every single asset, across every facility, can be connected through the internet (or an intranet), making data readily available to key decision makers, without the time and resource bottleneck of routing all of that information through a central SCADA system. When there is Ethernet everywhere and IP devices going out to the edge in the field, each one of those devices has the potential to become a threat to the entire corporate IT network if not secured properly. In comparison to a traditional SCADA system, this is a communication network on a much larger scale with thousands of potential end points. Operators in IIoT environments need to be concerned with everything that could be introduced to the network at every single connection point. This IoT data can be extremely useful, but safely enabling it requires a network that can meet the necessary security requirements. Using standards like TLS/SSL and basic AES-128 data encryption, secure connections can be established, even where data moves across an open network and it’s assumed that an unauthorized party could potentially see the traffic, such as in an Industrial IoT environment. When data is properly encrypted, an unauthorized party cannot access it even if they can see it. In wireless connections, standards-based connections allow relatively easy access to the moving data, leaving encryption as the only line of defense against snooping. Traditionally, companies have a corporate firewall that divides the corporate IT space from operational technology (OT) space. With an IoT network this division is greatly reduced, and so there is a need to protect the sensors and new applications on the OT side. However, even with a secure communication link, if the individual devices that are connected on the OT side become compromised and an intruder gains access to that communication link, they can push malicious data, cause denial of service (DoS), or introduce malware or viruses to the entire network, IT side included. There are many ways to run into problems on the IoT front if companies are not careful in their network design security implementation. On the IT side, corporate network security typically sees many threats. Those threats require significant attention, and consequently IT organizations have numerous options and tools to use, such as intrusion detection, log monitoring, network behavior monitoring, network inspections, whitelisting, firewalls, and more. The IT space has a much different attack surface than OT because with an IT network the company can physically secure the building and control where the data goes in and out. Data escaping the building is relatively small in comparison to the OT space. WiFi that is leaking outside the building could be a vulnerability, but there are tools and ways to lock down that type of threat, and checkpoints where the IT department can analyze the traffic going through the network. In IT, bandwidth is plentiful and the network overhead associated with security is generally not a major factor. IIoT networks, on the other hand, can span many miles with potentially hundreds of thousands of data points. This data often traverses a network with very limited bandwidth. An IIoT network likely consists of small embedded devices with long lifespans. However, they are generally not like operating systems found on an office computer, which regularly conduct updates to patch security flaws, among other things. Some embedded technologies don’t allow any updates, making it essential to carefully select devices which offer the desired features but do not compromise on security. Having thousands of these edge devices is where organizations will begin to see IT/OT convergence – many more points in the field where threats could be coming into the IT network. Industrial organizations today are creating a connected infrastructure with IP-enabled sensors or IP/IIoT-enabled Access Gateways. The data generated by sensors at an asset location can be valuable to more than just the central control system. This might mean machine-to-machine (M2M) communication with sensors talking directly to each other. It may mean that multiple systems consume the live, real-time sensor data directly from the field. It may even mean that operators connect their sensors directly to the cloud or other back office systems without going through a traditional SCADA system. If there is a way to share critical data that can help provide information to key data users while addressing security issues, then that information becomes increasingly valuable. IIoT solutions often utilize the widely deployed security technologies developed for the Internet to avoid the custom, one-off solutions of past industrial security. IP technology makes it easier to deploy and talk to sensors, but it also makes it easier for intruders to see and snoop on valuable data streams. Security through protocol obscurity is not a solution. There are many common attack vectors for industrial devices that become even more relevant when considering the IIoT infrastructures and fully networked, geographically dispersed projects. What are your requirements? Must haves versus Nice to haves? Are there any regulatory considerations? What is the IoT communications technology controlling or automating? Is it essential that it operates without failure? What technology solutions have a proven track record for the applications being served? How does this IoT communications technology address challenges such as data encryption, network access control and signal interference? Can the vendor describe the security mechanisms? Can you understand them? Do we need this technology solution to be fail-safe, in order to prevent or eliminate catastrophic damage from occurring? What are the threat vectors I’m most concerned about? Is cyber security or physical security a greater concern for this deployment? What vulnerabilities have the Information Security community identified in the type or category of IIoT equipment I use? Do I have a testing or evaluation plan in place? What ongoing improvements do I expect? Each company is different in how it approaches IoT and the resulting IT/ OT convergence. With this convergence, the firewall that separates the two becomes more complicated and less well defined. IT and OT professionals within the same company might put a different emphasis on security. The IT organization is typically owned by the CIO, who is being measured on how secure they keep the network. On the other hand, it’s less clear who is in charge of OT. It may be a foreman, who is more concerned with the system functioning because he is being measured on system performance only. As IoT continues to prove its value, it will be increasingly important for both sides to focus on the same security goals without making the networks and systems so difficult to use that it interferes with the functionality. There are many benefits to the concept of a completely connected IoT system, but this also implies more crossover between IT and OT systems. Companies need to prioritize security in their quest to create end points for all of their field assets. Some industries, like the smart grid, are already experiencing mandates that ensure a more cyber-secure network. With others, however, it is still up to the organization to make security a top priority. There are technology providers available that are security focused and will provide those extra layers of security to the OT network. The original version of this article was published by FreeWave Technologies Systems Engineer Jesse Steiner on RTInsights.com.